Cold weather often keeps preschoolers inside, looking to you to find them something fun to do. This winter you and your preschool-aged child can feed the winter birds by making a pinecone birdfeeder. You probably already have everything you need for this craft project laying around your house, and your child will have a great time hanging out with you and trying something new. *Note: If you don’t have any pinecones in your yard, try a local park. Some craft stores also carry pinecones. Place a large spoonful of peanut butter on a plate and give your child a knife to spread the peanut butter all over the pinecone. Repeat for however many pinecone bird feeders your child is going to make. To avoid getting bird seed all over the place, it’s a good idea to do the next step outside. Have your child take the peanut butter-covered pinecones outside. 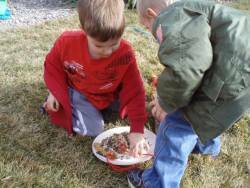 Pour some wild bird seed onto a plate and have your child roll the pinecones in the bird seed. Help your child tie an approximately 24-in. piece of yarn or twine around the top portion of each pinecone. Sprinkle some more bird seed on the pinecones to make sure they are completely covered. Let your child choose where he or she wants to hang the completed pinecone bird feeders and then tie the bird feeders in place. Sit indoors with your child and watch for visiting birds! This craft project is a big hit with preschoolers. My boys ate as much peanut butter as they put on their pinecones! Make sure to take pictures. 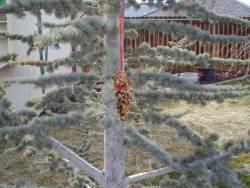 1 Comment on "Pinecone Birdfeeder"
I wrote this article last year and was just thinking the other day that my boys and I need to make these again this year. They absolutely loved making them and watching the bird seed disappear. Dawna, thanks for the great idea for making the bird feeders out of stale bread. Will have to try that too!